Very few phonics SI words use the SI digraph. Together SI makes the /sh/ sound, third after SH and TI. Here S and I do not make separate sounds. They are being used as a single multi-letter phonogram to make one sound. In other languages S and I usually make two sounds or retain their sounds as they are blended together. These SI, SION, and SSION worksheets make excellent ESL grammar exercises for learning adjective and noun endings for base words that end with s and d endings. Several of these are mixed in our SI worksheets. Print the K123 worksheet two-up for middle school children to have smaller lines like handwriting worksheets. It looks like a lot less work to the kids and actually improves their penmanship. Both nouns and adjectives use SI when adding a vowel suffix to a word that ends in an /s/ or /d/ sound or spelling. Where do they originate? The SI phonogram is derived from Latin words when adding vowel suffixes, so ESL students would need to know that in English you say one sound, /sh/ or /zh/, where they might say two in their own language. English does not use the /i/ sound in this phonogram. SI is not used to say /sh/ at the beginning of a word, only at the beginning of a second or following syllable. It's also not used at the end of a word because English words do not end in i. When there are two S letters at the end of a word and one adds a vowel ending that requires an I, the SI is pronounced as /sh/ as are TI and CI. When there is only one S, the sound made is more of a /zh/ sound. When there are two S divide the new syllable from the root word between the double letters. This way the SI stays with the new syllable and the first S indicates that the sound is /sh/. If the ending is to make a noun, add an i to make the ending SION with the short vowel sound of SHUN. When there is only one S, it goes with the new syllable and can make the /zh/ sound and SION sounds like the English short vowel syllable ZHUN. 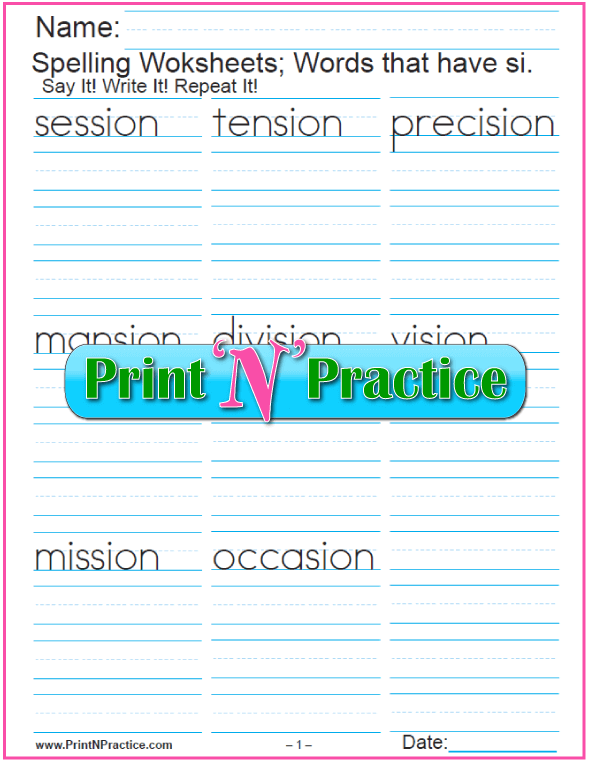 Kindergarten Large SI Worksheets - K-2, print 2-up for middle school. Third Grade Small SI Worksheets - Great size for grades 3-6. 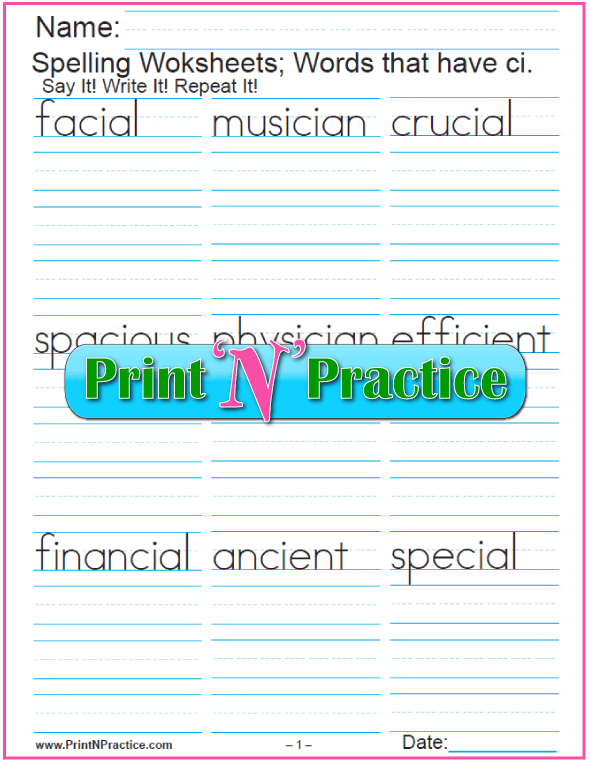 As you're teaching the phonogram SI, dictate these words for your children to write into their notebooks or on a piece of paper. The main thing is to have practice writing the /sh/ sound "by ear" while writing the digraph SI. The SI as SH worksheets above are a nice homework practice exercise. If your children can recognize this phonogram in their reading, they'll have an easier time reading two, three, and four syllable words. See the following simple sentences so you can dictate the words while teaching vocabulary. You can make variations for vocabulary class by adding more affixes to the beginning and end of these words. ascension – Ascension Thursday is forty days after Easter Sunday. compression – Refrigerating equipment runs under high compression. confession – Tell the truth when making a confession. depression – Press your foot in the sand to see the depression. dissension – Limiting disagreements avoids dissension. discussion – Tell the story in your discussion of what happened. intercession – The lawyer will make intercession before the judge. mansion – A mansion is a huge home. mission – Our mission is good customer service. recession – They found the artifact in a recession in the rock. profession – Nursing is a noble profession. progression – Progression through the line was slow. Russia – Russia is a country east of Germany. session – An Irish session is an evening of music and conversation. tension – A guide wire keeps the telephone wire under tension. Asia – Asia is a continent of land that has many countries. Asian – A person or thing that is from Asia is called Asian. decision – Think of your choices before you make a decision. division – Division is the inverse of multiplication. explosion – An explosion of dynamite broke the rock. Indonesia – Indonesia is a huge group of islands south of Asia. Indonesian – She bought a beautiful Indonesian dress. occasion – A birthday is a happy occasion. Persian – Alexander the Great was a Persian. precision – The precise tech ground the wheel with precision. provision – Make provision for rain when you camp. television – Television sends audio and visual signals across great distances. You can print these PDF printables or store them in a file for your child's phonics lessons and exercises. Whether they are reading the lists, write the words, or type the words, they'll have excellent phonics practice. You'll find some of your favorite phonics kindergarten, first grade, second grade, and third grade phonics books, activities, and videos from the same page.